When you're making candy bouquets, you need to keep in mind the occasion and the person receiving the gift. Don't add a lot of candy to a bouquet for someone older who might not like a lot of sweet treats, and try to avoid a lot of candies with sugar for those who have diabetes as there are sugar-free options. You can create small bouquets for a child's class or other groups, such as those at a church or business. Before you start making the bouquet, you need to find a container. 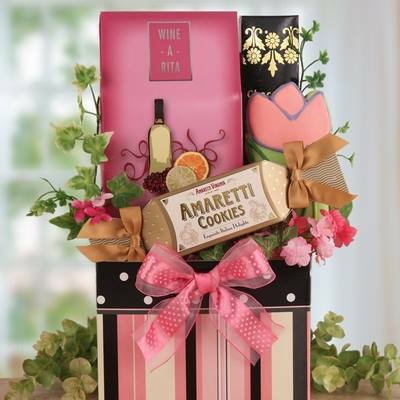 The container should be large enough to hold the candies that will be added to the bouquet. Gather all of the candy that you will use in the bouquet before completing the gift. You should also create a plan of how you want the bouquet to look before adding the candy. Place a piece of Styrofoam in the bottom of the container so that you have a base to hold craft sticks. Some of the candy that you use will be glued or taped to craft sticks, so you need to have somewhere to put them in order for them to stay in place. Cover the Styrofoam with cellophane or colored paper so that it won't be seen in the container. There are a few different options when it comes to making a candy bouquet. You don't have to use a basket like you would with other gifts. A fun idea is to make a sundae with the candy that you want to use. Get a glass that would be used to hold an ice cream sundae, adding white Styrofoam balls that will look like ice cream. You can add pieces of candy on top of the balls with ribbons flowing over the sides of the glass. Another option is to put candy inside the glass with a candy cane stick at the top that looks like a straw. You can make a floral centerpiece with candies that are yellow and white. Another option is a bubblegum bouquet. This would be an idea for a child or a teenager.